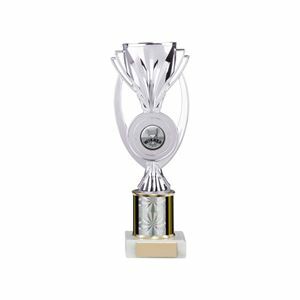 The Motor Cross Trophy Figure Top is a high quality glazed plastic figure top available in a choice of gold antique gold and silver finishes. The figure top displays a rider sat astride a motor cross bike as if performing a jump. The Motor Cross Trophy Figure Top has a screw fixing at the base of the figure, allowing you to pair this figure with your choice of compatible trophy bases, creating a trophy that will meet your presentation needs. Great offer. FF Motor Cross Trophy displays an action motor cross rider and his bike set on a wing styled riser. The motor cross trophy is made from superior grade plastic, lacquered in silver with golden trim and mounted on a small plinth. This item is offered at a great low price with a minimum order quantity of only 12 trophies. 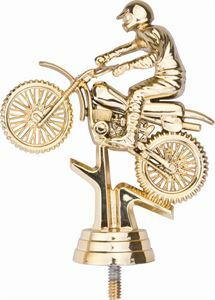 This detailed trophy displays a golden motocross bike and rider mounted on top of a glossy holographic effect column. The figure top is made from premium plastic and is coated in a durable performance lacquer. The column can be chosen from a range of 8 colours and comes in choice of 4 different heights. The Motocross Figure Top Trophy is mounted on a marble plinth upon which a self adhesive engraved plate can be applied to provide an extra special touch.